His legacy plugged by no less than The Pope Himself -- who recalled him with "admiration and gratitude" in addressing his many heirs last week -- the father of American Catholicism, John Carroll of Baltimore, took center stage in a major lecture given Tuesday night in the cathedral he envisioned, but never saw completed: Charmopolis' Basilica of the Assumption. Held to commemorate both the bicentennial of Carroll's elevation as the nation's first archbishop and the impending reception of the pallium by his 14th successor, Archbishop Edwin O'Brien, on-deck for the talk was one of the bench's handful of historian-prelates, Archbishop Timothy Dolan of Milwaukee. For other media, Cathedral Street's posted both fulltext and podcast of the lecture... However you catch it, know your history and check it out. On a related note, Carroll was also the launch-pad of O'Brien's homily at Baltimore's bicentennial liturgy earlier this month. As founding bishop, this premier missionary and persevering evangelizer of our new nation truly laid the foundation of Catholicism in America . 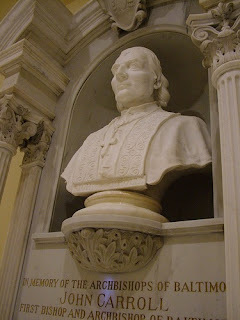 He convinced Rome and some skeptics at home of the compatibility of Catholicism and a free democracy. A friend and confidant of Benjamin Franklin, George Washington and Thomas Jefferson and a supporter of many civil causes and institutions, what Washington is to our country, John Carroll is to the Church in our country. In his 25 years of shepherding, the Catholic population of the expansive Church of Baltimore doubled as did our number of native priests. He founded three colleges and two seminaries and strongly promoted the foundation of many religious orders, receiving the vows of the now St. Elizabeth Seton. He would go on to encourage and support the establishment of both the first distinctly American community of religious women and of the first Catholic school in our land. The list of Archbishop Carroll’s accomplishments could continue almost endlessly. But as we celebrate Good Shepherd Sunday, and as we prayerfully mark The World Day of Prayer for Vocations, it is good to take stock of the spiritual wealth of the Church in our land and its humblest of all beginnings. A sheepfold few in number then, and now so vast – surely due to Christ’s good shepherding of a flock certain of his presence, and consequently full of hope: If the Lord is my shepherd, there is nothing I shall want. As we enter our third century as an Archdiocese, our challenges are different from those faced by Archbishop Carroll, but no less daunting. Now as then, the sheepfold, which is the Church, can never be an island, isolated and impervious to the people she serves. We Catholics cannot rest, and never have rested, contently and complacently in our secure sheepfold. Indeed in our midst are pastures poisoned with drugs, dark valleys overwhelmed with the hopeless homeless, fields plagued by abortion mills, reverberating with gunshots and murders. There are tables not filled, but empty of food both for the physically hungry and for the spiritually starved. And this, not solely in pockets of Baltimore City but in areas large and small, urban and suburban, indeed in all counties of our great Archdiocese. Our culture, our Church of Baltimore, with hope looks forward to a new generation of American missionaries with John Carroll’s single and simple purpose: only God and our salvation. I have also been privileged in recent years to witness the heroism of your generation, to see so many willing to give their lives totally and even to death for others in the service of this nation. I will continue to challenge you, young Catholics of Baltimore, to do so in service of God and Christ’s Church. We offer you: no salary, no recompense, no holidays, no pension. But much hard work, a poor dwelling, few consolations, many disappointments, frequent sickness, a violent or lonely death, an unknown grave. The money-quote, however, came when the incumbent of the Premier See dropped the bomb that "Baltimore is as much a missionary diocese now as it was 200 years ago. "Look around and have no doubt," he said. Suffice it to say, it was a joy to be part of that celebration... and to begin the week of Stateside Catholicism's relaunch with a prayer at the tombs of Carroll and Gibbons, whose legacies remind us always that the church is only its best to the degree that it serves as "the friend of the people" and, thus, a witness to the world. And speaking of Dolan -- a bear-hugging friend of the people if ever there were one -- the Pope's plane hadn't even left Brooklyn when the next Big Story on the beat began edging its way to center stage: the coming retirement of Cardinal Edward Egan and B16's appointment of a new archbishop of New York, a handover expected to take place within months, almost certainly before year's end. Before Papa Ratzi even hit the field at Yankee Stadium, the Times started down the trail... followed quickly by the Daily News, both featuring the Milwaukee archbishop atop the papers' lists, yet with Archbishop Wilton Gregory of Atlanta close behind. For what it's worth, the subject was already treated extensively here on Easter Sunday... and, from all sides, there's more -- much more -- to come. Given the Vatican's continuing view of Gotham as "capital of the world," from the Roman lens this process is building up to what'll likely be the Mother of All Appointments -- maybe, given the current American situation, the most important personnel move B16 will make in the course of his pontificate, period. The shape of the speculation might not exactly match that of the terna, but the coverage does reflect the clarity of the two top qualities sought in the Big Apple's tenth archbishop: a candidate able to both restrengthen relationships with his priests and restore the office's traditional prominence in the public square, both in the city and beyond. For his part, the only person who can definitively foresee what'll happen showed bits and pieces of his hand while in the city, including bringing its auxiliary bishops a good bit closer to him than usual so he could sound them out. But even so, "with God as [his] judge," Egan gleefully reported that the Pope's first words following his New York liturgies weren't ones of packing, but praise. "The music here is marvelous!" Benedict gushed.